Emergency! The definition varies widely with different people. Some think a hangnail requires a visit to the emergency room, while others think it is only an emergency under dire circumstances. But what about an emergency roof repair? What exactly constitutes something that needs immediate attention? Emergency roof repair is something that a number of roofing contractors offer. But what is this exactly and how can you tell when it is necessary? Missing shingles may or may not qualify as an emergency, depending on the number of shingles that are missing and the area of the roof that is uncovered as well as the current weather. If you hire a professional and it is an emergency then you may get a very rapid response, but you can expect to pay more as a result. Many roofing contractors are booked weeks in advance or even longer, and a higher price may be charged if they must respond to your home roofing issue right away. This is really true if the roofer must come out after hours, on weekends, and holidays. ThisOldHouse.com makes a point that an emergency roof repair does not have to be pretty, it just have to protect the home from the elements until more permanent repairs can be done. 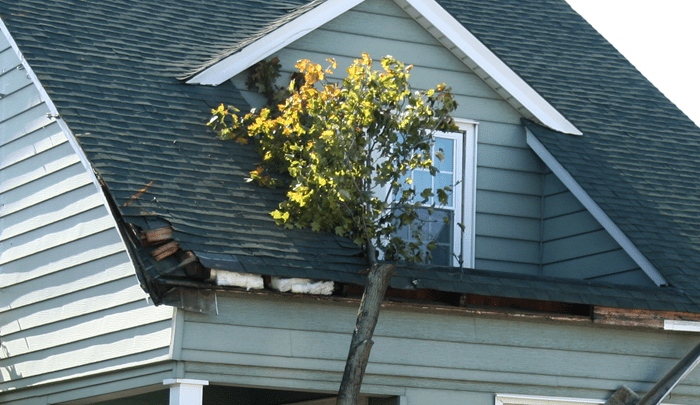 What Constitutes an Emergency Roof Repair? An emergency roof repair is a repair to your roof that cannot wait several days, or even several hours in some cases. If your roof starts leaking severely, if part of the roof or ceiling comes in, or if severe storm damage has caused one or more large areas of your roof to be weakened or exposed to the elements in any way. If you notice missing shingles in large numbers then this can constitute an emergency roof repair. An occasional shingle that is damaged or missing is not a big concern, although this should be addressed as soon as possible in order to prevent a bigger issue later on. If too many shingles are damaged or completely gone in one area then this can cause damage to the materials underneath. Leaks may or may not be an emergency roof repair, but they are also not something that you want to ignore for a long period of time either. If the leak is severe or a large amount of water is coming in on a regular basis then it may be worth the extra cost to have your problem addressed immediately. If you only have a small drip once in a while then the roof can probably wait until regular hours. In addition to numerous missing shingles, another situation that may be considered an emergency roof repair is rot in your roof deck. This can be caused by moisture getting in, improper ventilation, and other problems. If your roof deck is rotted, this can pose a structural hazard and needs to be handled right now. An unsafe structure is dangerous for anyone in the building, and if your roof deck has rotten areas then structural damage is a real possibility. Roofing materials can be heavy, and rotten wood loses strength. If your rood deck has damage then this could cause the roof to come in and fall down, posing a risk to anyone in that area of the home. It is important to remember that emergency roof repair can be more expensive. You need to do a cost benefit analysis, determine if there are any dangers or safety risks, and then decide whether you are willing to pay more to have emergency work performed. Some roofers keep an open schedule, and they may be able to look at the damage within a day or two without extra charges. If you try to do roofing repair and you do not perform the job right you could end up needing further work on your roof at a later date because of new leaks and other issues. From our article, 5 Reasons You Should Never Attempt Roofing Repair Yourself. Click here to read the complete article. Just How Bad is Your Roof Damage? Be realistic about the actual scope and extent of the damage to your roof so that you understand whether an emergency roof repair is really needed. In some cases, you may be able to have your roof inspected and this can help you determine whether a roofer is needed ASAP or if a small delay is acceptable. Is Your Home Interior Exposed to the Elements? Whether you have just a few missing shingles or your roof is laying in your living room floor you will need a roofing professional, the only question is whether the need can wait for a few days or if it is so pressing that it must be taken care of right away. If your home interior is exposed to the elements this is an emergency. If you need an emergency roof repair call us now at 314.966.4889 or 636.724.1300!